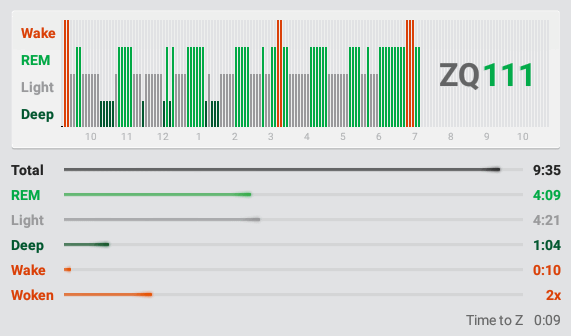 The Zeo Sleep Manager Pro system consists of a lightweight true EEG brainwave monitor “pod” which snaps onto a replaceable and adjustable headband. A standard 5-volt micro-USB charging cord and wall charger are also included. 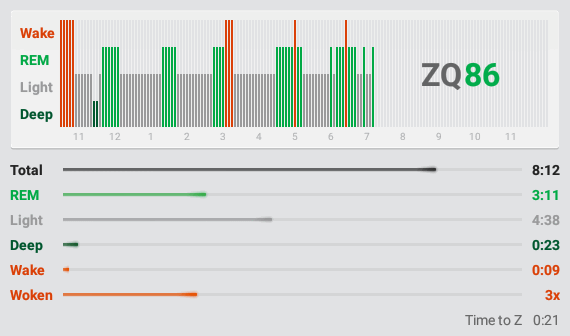 The Zeo Sleep Manager Pro is an amazing little and unique device. It contains a high-performance differential instrumentation amplifier which is sampled and digitized at 128 Hz. A Silicon Labs 32-bit ARM Cortex-M3 runs a fast fourier transform (FFT) to process sets of those “time domain” samples into their instantaneous spectral content. The combination of this “frequency domain” spectrum data, plus artifacts of detected eye muscle movement, are fed into a laboratory pre-trained neural network expert system to determine the wearer's current sleep or wakefulness state. Much as many may wish it, nothing you wear on your wrist, place beside or underneath you on your bed, or next to you on your bedside table, can possibly determine the internal state of your brain. Before discovering the Zeo, I tried all of those things. They are worse than worthless junk. And, most sadly, while they probably can count your steps and monitor your heart rate, it was their utterly false claims of “can also monitor your sleep” that were responsible for driving Zeo ‑ the only product that actually can do that ‑ out of business. Note that a San Diego, California based company, ResMed purchased Zeo's intellectual property. Sadly, ResMed produces another of the cannot possibly (and doesn't) work bedside sleep monitors, the S+. It bathes the sleeper in microwave radiation and uses the Doppler-shift in reflected microwaves to detect upper body motion and respiration. Aside from bathing its user in microwaves, which seems somewhat contradictory to health-promoting, and having no idea what's going on inside the sleeper's brain, thus being more wrong than right, it is confused by anyone else who might be sharing the same bed. No thanks. “Companion for Zeo” application home on Github. “Companion for Zeo” at the Google Play store. “Companion for Zeo” at the Amazon App store. The history to date of my nightly recordings. “ZeoBand” is a new startup that may be producing replacement Zeo headbands. Zeo has a Wikipedia page. Here's a Do It Yourself (DIY) Zeo headband sensor pad replacement page. You will also find a TON of Zeo enthusiast material on the Internet. You will obtain FAR GREATER SUCCESS (meaning few to no acquisition interruptions during the night, I've never had one), and much longer headband life, if you freshly clean and remove the oil and loose skin from your forehead before placing the headband. If you have ever had an EKG you know that your skin is always “prepped” with a lightly abrasive alcohol wipe before placing the electrodes. Even though the Zeo is a consumer product, it is still a high performance, highly sensitive instrumentation amplifier and data acquisition system. 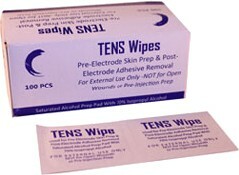 I have been using these perfect little “TENS Wipes” with total success for the past six months. Amazon sells this box of 100 for $6 with free shipping. I recommend them without reservation, and you really do need something like them. You must clean the headband electrode pads before first use and occasionally thereafter. Since the headbands were manufactured before Zeo went out of business in 2013, the silvering of the headband's conductive pads will have oxidized. The headbands are presumably kept in hermetically sealed packaging to minimize this tendency. Silver oxide is an electrical insulator that will prevent the Zeo from registering its presence on your forehead and functioning reliably. Therefore, before first using a newly opened headband, and occasionally every week or two afterward, you should use one of the alcohol wipes shown above to gently wipe and remove any accumulated silver oxide (and eventually skin oil). The first time you do this you will likely see some dark brown oxide residue on the wipe. Be gentle since you want to remove the oxide and not the silver. Headband tension: The Zeo headband is elastic, with a tension that can be readily adjusted with velcro tabs on either side of the front pod mount. We are learning that even with a freshly cleaned forehead and clean silvered electrodes, light electrical forehead contact is insufficient for reliable operation. The headband's electrodes must be firmly pressed against the user's forehead. If the Zeo fails to register its presence on your forehead, or if nightly recordings are intermittent or interrupted, and if you have cleaned your forehead and headband, the next thing to try is increasing the headband's tension. It does not need to be prohibitively uncomfortable and you should be able to find a happy compromise with both comfort and reliability. But it does need to be firmly held to your forehead. An important and non-obvious Zeo-use concept: The Zeo pod's attachment and detachment from its charger is an integral part of its user interface operation. In other words, we are accustomed to devices that we attach to their charger in order to charge them. But the Zeo folks made their system “easier to use” by giving the attachment/detachment operational meaning: Detachment from its charger explicitly places the Zeo in “Bluetooth pairing mode” if it is not already paired, or in “waiting for headband to be placed on head” mode if it has already been paired. And, similarly, attaching the Zeo pod to its charger affirmatively terminates whatever monitoring session may have occurred while the pod was off its charger. Plug the new Zeo pod into its charger for several hours. While the pod is charging, its LED will be flashing green. Once the pod is fully charged, its LED will be solid green. Once the Zeo pod is fully charged (solid green LED), and with the Zeo pod still on its charger, turn on your Android device's Bluetooth radio and place the Android device into “discoverable” mode. Now remove your Zeo from its charger. Since the pod is not already paired, it will automatically go into pairing mode and your Android device should find a "Zeo" and offer it for pairing. Accept the Bluetooth pairing and you're ready to go. The green led flashes while it's charging and is solid green once it has fully charged. The pods will be fully discharged when they are first received, so the initial charge will take several hours. Plug it in for your first use as early as possible well before bedtime. Rightside up or upside down? The pod doesn't care which way it is worn. I tend to wear mine with “USB port down” and the light and button up, but it really makes zero difference. There was no documentation in the box. I have several sets of the whole, unopened, original packaging which I previously purchased from eBay sellers. Even the brand new unopened Zeo system comes with almost no documentation. Zeo apparently intended to rely upon the sparse documentation contained within their iOS and Android apps. So we are not missing anything by purchasing only the hardware without any box and docs. There were none. The pod has no power switch, so it must live on its charger during the day when it is not on your head. I initially assumed it would not discharge during the day, so I took it off the charger once it had charged and it was totally dead when I went to put it on that night. Therefore, you should arrange for it to be convenient for the pod to always be charging when it's not being worn. And, as I mentioned above, the Zeo uses charging attachment and detachment events as significant user-interaction events. Returning the Zeo pod to its charger is the only way to end the night's session. The pod's micro-USB charging port has a nice (but ultimately annoying and superfluous) rubber cover. After fussing every day for a few weeks with that annoying rubber micro-USB charging port cover, I gently pulled it off. The little rubber tie snapped intact out of its retaining hole. I have it in case I ever need it... but I won't. It is SO MUCH NICER without that unnecessary cover. Consider this: You will be plugging & unplugging that micro-USB cable every single morning and night. Micro-USB is notoriously difficult to orient with a 50/50 chance of getting it wrong the first time. And it's not readily clear whether it's right or wrong until you push more than you want to if it's wrong. So allow me to urge you to invest just once in arranging to know the proper orientation for your cord. For example, I have a micro-USB from an HP charger that has a slivered concave depression on one side. So now I know that dimple faces the BACK of the pod... and I never need to fuss with it. The pod notifies the Android app of its current mode: when it's charging, charged, disconnected from charger and on your head. That status displays on the app, though I have noticed that there can be a bit of delay once the pod is on forehead. This turns out to be an occasional lack of screen refresh within the app. Switching away and back has always succeeded in updating and showing the proper status. The Zeo app has a “notification sounds” option that allows you to associate the Zeo pod and headband status with an audible sound. I've done so, and it's nice to hear the Android device recognize when I connect or disconnect the pod to its charger, etc. The Zeo App has a "share" feature that eMails an image. But the image is a bit large. So what I've been doing instead is tapping the final "dark" chart, which selects it and shows a detailed chart with individual sleep state times. You can then rotate the device for the size you want and take a screen capture (simultaneously pressing volume down and power), then go to messages and eMail the screen capture. If you come up with any more tips, let me know and I'll update this guide. 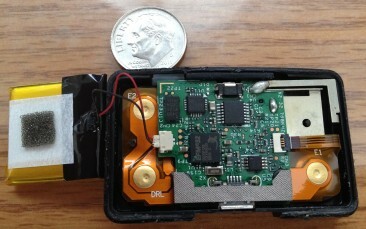 The only known weakness of the Zeo system is that its internal 3.7v lithium-polymer (LiPo) cell is not designed to be user replaceable (like most smartphones, tablets, etc.) and we know that LiPo cell technology has both a finite cycle lifetime and also a maximum shelf life. I assume that eventual failure will manifest as incomplete nighttime monitoring as the cell runs out of juice sometime during its nightly monitoring. The good news is Zeo pods have been successfully cracked open, and LiPo cells of similar size and capacity are widely available. So when the time comes, we may have a ready solution for those who wish to continue using the Zeo system far into the future. 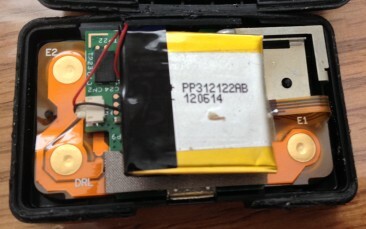 The original Zeo battery measures 22mm x 21mm x 3mm. It appears that many compatible batteries are available in bulk from Chinese suppliers for around $6. The sample pictured to the left is also 3mm thin and 25x20mm which would appear to fit the Zeo's enclosure. If the ZeoBand people do succeed in firing up a replacement Zeo headband business, perhaps they can also purchase and resell replacement Zeo batteries. Either way, it appears that anyone who wants to keep their Zeo's alive for years will have the means to do so.